There are actually many different stoves found in homes today. There are electric stoves and gas stoves. Gas stoves use electricity too, but only to operate clocks, timers and such. Regardless of what type of stoves you have in your home our professionals at Appliances Repair Vaughn can service them quickly and cost effectively. We keep plenty of parts for these appliances in stock in our inventory and on our trucks. We do this so that we can administer more effective service for our customers. The stove is obviously one of the most important kitchen appliances found in any kitchen. These units are essential for cooking food for the family meal. Most families have a certain routine they try to follow every day. That routine can be thrown out of whack if this cooking appliance stops working properly. We provide urgent stove service because we know how upsetting it can be not to be able to cook meals on a regular schedule. We believe in getting the job done right the first time. Our customers depend on us to arrive rapidly, detect the problem and make the fastest cost effective resolution possible. Our professional technicians will never take shortcuts, but we will work with a sense of urgency for our customers. Our stove repair team in Vaughan is devoted to taking good care of those we serve in the community. When we repair stoves we use all of our experience and skills to make a strong impression. 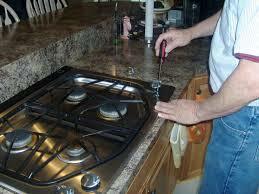 Our experts also provide stove installation service. Depending on what type of stove you have purchased you may need professional installation assistance. Gas operated stoves and ovens will often need a professional to install them and ensure there is not dangerous gas leaks present. At Vaughan Appliances Repair we felt better knowing your unit was installed professionally and safely. Give us a call today.